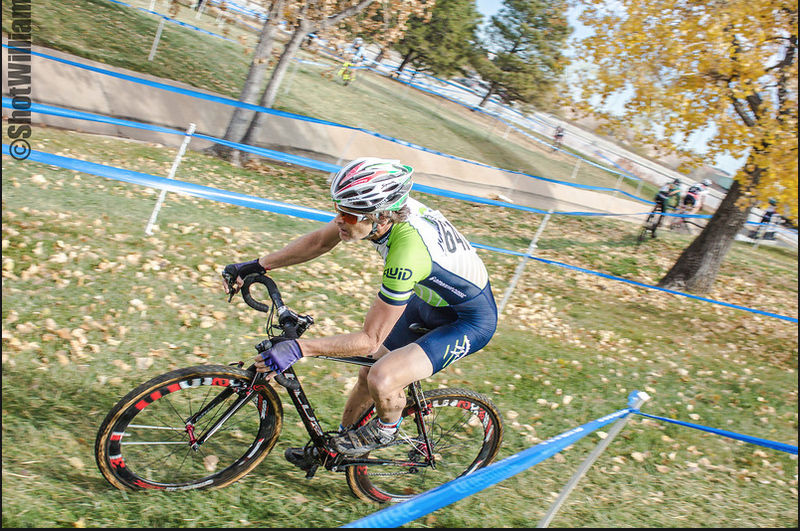 The first weekend of November brought us continuing great weather along with a pair of classic Colorado cx courses in Interlocken and a return visit to Xilinx. We also had a fun addition to our routine as the Clouse family from Park City, UT stayed with us over the weekend. Ed, along with 12yr old Katie and 14yr old Evan drive over for the big race weekends in Colorado because our racing scene is more robust than Utah’s. They’re a great family and our kids love them, so it was fun to have them there. Kristal in mud. This was rideable in the early races but became a run later. And provided much amusement as there were many crashes in this area. As we mentioned last week, the Interlocken course is always a compact course, run in a bowl like park in nearby Broomfield. 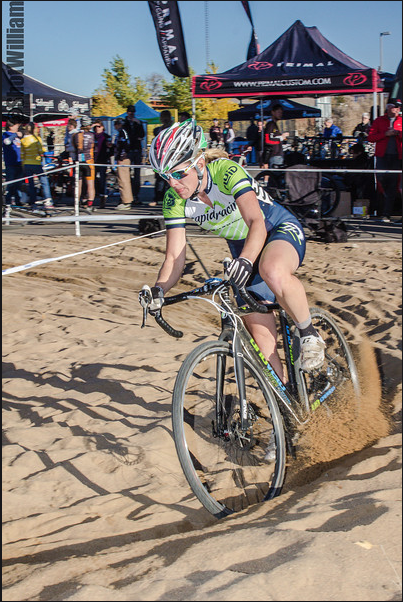 Since it is nearly all grass, with only brief sections on cement sidewalks and sand volleyball pits, this race favors the rider that can put out steady power. The course this year was a little more twisty than in the past, with some good off camber and a mud bog, so did have some additional technical features and virtually no recovery. Carl showing that running is faster than riding in this case! This was also the first race day following the ‘short’ schedule, so Kristal raced at 9:05a with Carl and Rob lining up immediately after her. That meant that much of Carl’s warmup consisted of riding the trainer in the pits. Nick was a huge help, holding Kristal’s bike so that Carl could just jump off to catch if an exchange was needed. Kristal didn’t end up visiting at all, but Carl was able to help our good friend (and eventual race winner) with a bike change mid race. 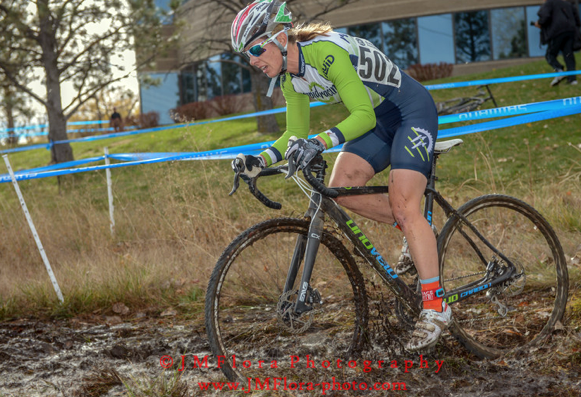 Kristal’s race went well overall and she continued to feel improved form, finishing 6th. Katie ended up 9th in the SW Open. Rob playing on his favorite course! Carl and Rob lined up next in the 45+ Open. As always, the field was strong. Carl finally felt like he is on track with a solid ride to finish 26th while Rob showed his grass skills finishing just 17 seconds behind him in 28th. Both of them were moving forward solidly and may have gained additional spots, but the race was inexplicably cut a lap short. Bard demonstrating proper sprinting technique...on the drops! And it made a difference, he won this sprint by .07 seconds! Bard continued his upward trajectory, riding solidly on the challenging course and outsprinting another rider for 32nd place in a field of nearly 60 riders! Finishing up the day’s results, Evan won the SM3 race by over half a minute. Overall, a great day and lots of smiles heading home! As opposed to the earlier race at Xilinx that took place primarily in the ‘front yard’, the Blue Sky race makes more use of the more solid ground of the north side of the campus. The start was up a good paved grind across a parking lot, then jumped onto dirt singletrack, narrowing down to 3-4 riders wide. After that, it wound downhill, then back up before coming to 2 sets of half barriers (at least for the morning races), tempting riders to bunnyhop—more on that later (foreshadowing! )—before heading through trees, up some steps, and back to the finish. Errin kicked things off with a really solid ride for 4th place in a field of over 30 riders! I lined up with increased confidence after the previous day’s ride. I got a decent start and survived the chaos when we hit the singletrack, staying upright and resisting lots of banging, including one big guy riding about 20 feet leaning on top of me—helps to be short and stocky! I was riding somewhere in the top 20 on the 2nd lap when I noticed my left shifter was loose. I was able to stay off of it until I could get to the pits where Kristal made a fully pro exchange onto my pit bike. I immediately noticed the rear tire was at about 15psi—could have sworn I had checked that—but, no problem, just rode carefully for a half lap and Kristal had my A bike ready again for me so I made another quick exchange. Those issues had dropped me a bit in the field, but I was feeling great and making up lots of ground. 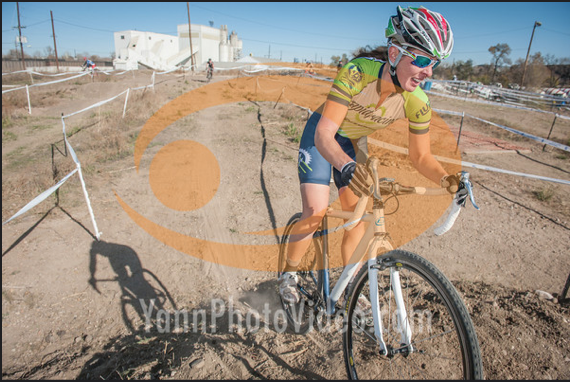 Unfortunately, that led to me riding too fast through the second set of barriers and clipping my rear wheel on the second one while bunny hopping. That impact threw me over the bars and straight onto my head. Dazed, I jumped up and remounted, only to find my chain was off. It took me about a minute to sort that out and then noticed that in the crash I must have kicked my rear brake caliper so the wheel was jammed. I shouldered my bike and started running (about ¾ of a mile) to the pits. The leaders passed me just before I got there, so I changed bikes and rode the short remaining distance to the finish line. When I got back to the van, it was pretty apparent the crash had left me with a concussion, as I was pretty foggy still, nauseous, and light was bothering me. I took it as easy as possible the rest of the day, other than working the pits for Kristal. Finally, it was time for the main event, with the Women’s Open lining up with 20 riders and all the heavy hitters. Judy Freeman jumped out of the hole shot for an early lead with Katie Clouse glued to her wheel. Kristal had trouble clipping in, so was buried further back in the field. Katie would manage to stay on Judy’s wheel for 3 laps, before drifting slightly but holding on to 2nd place. Kristal, on the other hand, was able to climb up a number of places before the legs started to give out from the previous day’s efforts and finished in 9th place. Women's Open getting through the bog on the first laps. This venue is one with which much of the community has a love/hate relationship. It centers around a large, grassy bowl up which the course generally runs twice. Add to this the high winds on this particular day and it was a total power course, described as ‘brutal’ that dished out serious beatdowns! Carl was still suffering concussion symptoms, so was sitting out this weekend, but still out cheering and working the pits. Errin taming the 'BOD' and getting the win! Kristal went off first, just as the wind started to kick up. 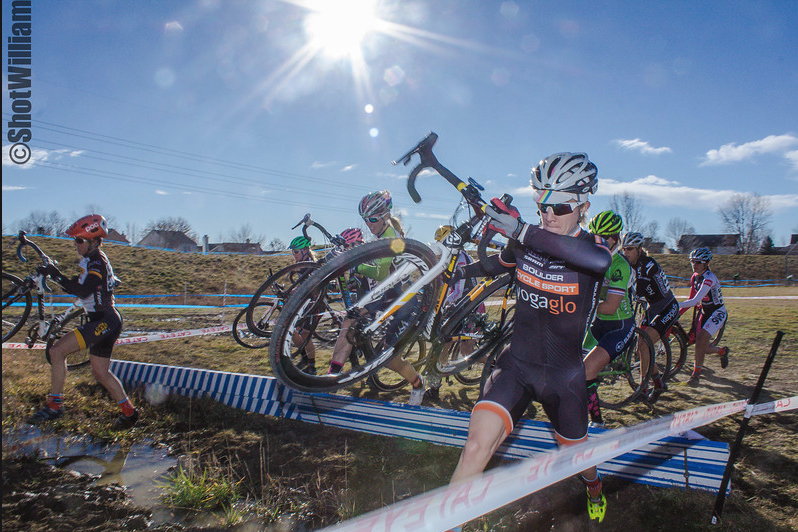 She got a good start, in 3rd place up the first runup, but then disaster struck. About a quarter way through the first lap, another rider went through the tape, and the broken section wound its way into Kristal’s drivetrain. She struggled to clear it as her field rode away, and then the SW35+ field that started 2 minutes back also passed her. She eventually had to take the rear wheel completely out to clear it. All this time, Carl was in the pits wondering where the heck she went! After that setback, she did great—riding back through the entire SW 35+ field and back into the SW Open, eventually finishing in 12th place. So, yet another example of great ride, poor result! 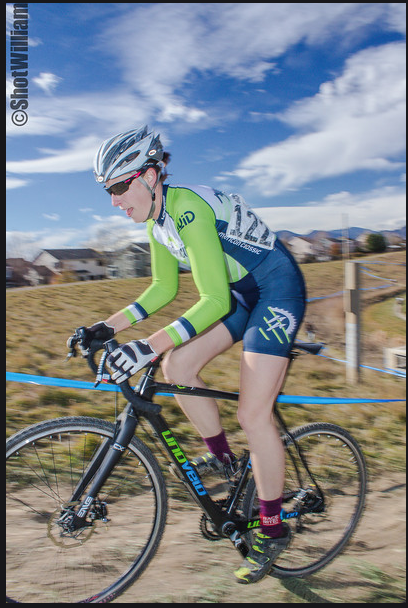 Errin, on the other hand, wasn’t messing around with tape in her race. She went to the front early and showed her strength, riding away from the field of 37 to win by over 40 seconds! With that result, Errin gets her upgrade to the SW3 field and is on her way up the charts! 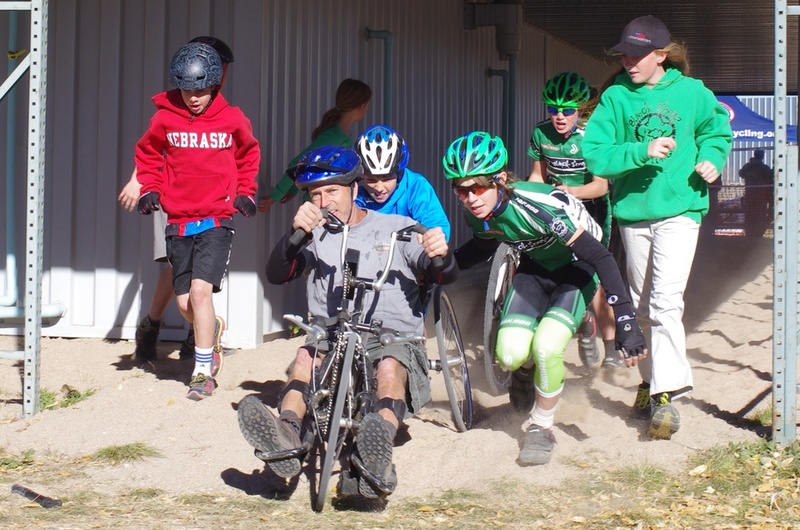 Kids helping the Adaptive class through the sand. Very cool! Kristal gave the Singlespeed a whirl in the morning. Carl was bummed to miss this race. We did it last year and it is really cool—held in north Denver in an industrial area with a unique course and laid back vibe. It reminds us of races ‘back in the day’, when cx was a lot less serious. Topping it off was the fact that our good friend, Dave Towle ‘the voice of American cycling’ was announcing and it was just a great event. The Women's A race was really small but none-the-less it was a fun time on a cool course. On the first lap Kristal's change dropped and got stuck (it was turning out to be a weekend of mechanicals!) Fortunately she was right near the pits and her ever faithful pitcrew ie: Carl and Cate, handled the bike swap perfectly. Kristal went on to win the Women’s A race, even riding the entire sand pit on her last two laps, just to show that she could. To really get a sense of the course click on the links below for pictures and videos. Lots more pics and videos! The pavé was built specifically for the race! A fun, deceptively challenging feature. Putting all the mechanicals and injuries behind us, we are looking forward to this weekend. Carl is still recovering but the rest of the team will be taking on the Grand Staircase in Westiminster. Tagged with UnoVelo, Runa, American Classic, Kristal Boni, Carl Boni, Bard Higgins, Rob Gilbert, Errin Vito, Deidre Moynihan, MUCCY, Bowl of Death. November 21, 2013 by Kristal Boni.